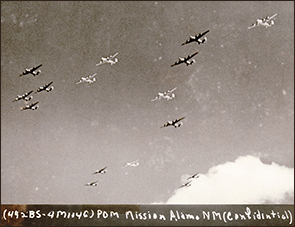 The 492nd Bomb Group flying their POM (Preparation for Overseas Movement) Mission in Alamogorgo, New Mexico. The commanding staff for the 492nd had been organized and disassembled during the year of 1943. By the end of December the Group was starting over again with a small echelon of staff officers and flyboys leftover from the former Col Pierce's command (see Link ). The new commander hadn't been selected yet and the Group fell under the temporary command of Major Louis C Adams. The Army Air Force wanted this Group war-worthy and deployed to England as soon as possible. When the US entered the war it was unprepared and under-strength. Hitler determined it would take the US at least ten years to build a formidable war machine that could pose any kind of threat to his present one. Of course, he seriously underestimated America's industrial strength. Needless to say, experienced US military personnel were rare to find, particularly in the Army Air Corps. Any kind of experience, training and formal education was considered a premium. Every outfit did whatever they could to get the most experienced personnel available. Before the war the Army Air Corps required a college degree for those wishing to become pilots. After the war broke out, all of graduates were quickly snatched up by all of the military branches. The pilot standards were lowered to two years of college, then later to any college experience. Finally it came down to whether or not an applicant could pass a test. The silver bars worn by Captains and 1st Lieutenants were earned by the men who wore them. Their ranks indicated that they had experience, training and education. By using ranks as a yardstick, one can get an idea how much or how little experience was in the Group. But, rank totals don't always tell the whole story. Major Adams began pushing the "Tucson Twenty" through group training. For most of the month they were all he had to work with until another batch of sixteen crews were sent down from the 331st CCT in Casper, Wyoming (see Link and Table ). The following day, on 27 Jan 44, Lt Col Eugene Snavely arrived to take command of the Group. His work was cut out for him because he had about two months to put a worthy group together and the Army was sending him green crews. Snavely saw that he needed to get more experience in his crews. He didn't have to look very far to find some. He had within the old echelon staff some experienced pilots and officers who had completed Applied Tactical Training in Orlando, Florida. He began disassembling some of his new crews and used the personnel to build better crews around his "Orlando Boys." For a lack of a term for his actions, we've dubbed it the "Alamogordo Shuffle." Snavely replaced twelve of his green 2nd Lt pilots with four experienced 1st Lts and eight 2nd Lts that he had inherited from the old Pierce command. Those twelve green pilots were demoted to co-pilot or moved elsewhere. It may had hurt some egos at the time, but it was in the best interest of the Group. Plus, it gave Snavely an emergency pool of trained aircraft commanders in case they were needed. This turned out to be good planning because they would, indeed, be needed. The "Texas Boys" also came with some inexperienced crews. Again Snavely put his "Alamogordo Shuffle" to work as he constantly was re-evaluating and tweaking his crews. His shuffling didn't stop in Alamogordo either, as he did more shuffling once they got to England. Col Snavely pulled off what looked to many as being impossible. In his first seven weeks of commanding the 492nd, he had transformed his 68 crews of greenhorns into a well trained group ready for combat. Table clearly shows how effective his Alamogordo Shuffle was in upgrading the officers of the 68 CCT crews initially given. On 17 Mar 44 Brigadier General Newton Longfellow, commander of the 16th Bombardment Training Wing, gave the Group a passing grade. Preparations for Overseas Movement ( POM ) began at once. Of course, the Group would go on to encounter some hard luck that practically wiped it out. They would become the only group in US history to be disbanded because of high casualties. But not for the lack of training and leadership. The men, the crews and the staff in the 492nd were good. Perhaps their casualties would had been higher if they weren't. They simply ran into some bad luck. Page last modified Wednesday, January 13, 2010.